All of a sudden the long weekend that includes Presidents’ Day, the third Monday of February when schools and banks are close, is only a few days away. What would have been a good time to fly south for a short, sunny break is likely going to be too difficult to book now. Airline flights and hotel rooms in places such as south Florida are typically at a premium that weekend, if still available. However, instead of playing the “should-have” game, think of the weekend as a fun opportunity. The following suggestions work anywhere even though the examples given are for the Chicago area. Nowadays all hotels have a fitness center so that would no longer be a deciding point on where to take your weekend vacation. Think about what you most want to do. Shop? 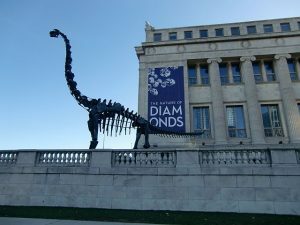 Visit museums? See art and architecture? Go to the theater? Do it all? Next, how important is a pool? Few downtown Chicago hotels have pools but some have indoor lap pools. Even fewer have a pool where children can swim all year round. You can keep the bathing suits in the suitcase you planned for a trip south if spending the weekend at The Intercontinental on Michigan Avenue’s Magnificent (Shopping) Mile. It not only has a pool, it is historic and large. The spa and fitness area is now a part of the hotel pool area. The hotel is nicely placed for a “staycation.” Walk north from the hotel for Michigan Avenue shops. Walk south and cross the Chicago River a few blocks to Millennium Park for ice skating and “Cloud Gate” better known as “The Bean.” A little further south is the Art Institute of Chicago. You are in a great spot to appreciate downtown art and architecture. Cross Michigan Avenue from the hotel to take a bus to the Museum Campus’ Field Museum, Shedd Aquarium and Adler Planetarium at the south end of Grant Park. All of February is free general admission for Illinois residents at the Field. Presidents’ Day, Feb. 20, is free admission to the Adler Planetarium and the Chicago History Museum in Lincoln Park. Get a jump start on Oscar night, Feb. 26, 2017 by seeing the nominated movies at your local theater. Best Picture nominees are: “Arrival,” “Fences,” “Hacksaw Ridge,” “Hell or High Water,” “Hidden Figures,” “La La Land, ”Lion,” “Manchester by the Sea” and “Moonlight.” Most theaters offer advance tickets. The AMC theaters at Northbrook Court were recently remodeled with really comfortable seats and a bar to get drinks and food. Or settle in with popcorn or pizza at home as you check Netflix or On Demand for past Oscar winners. Some are oldies. Others are just goodies. Go to a zoo or aquarium then forget the diet and splurge on cupcakes at places you’ve been meaning to try. In Chicago, the Lincoln Park Zoo has a wonderful, new penguin center. 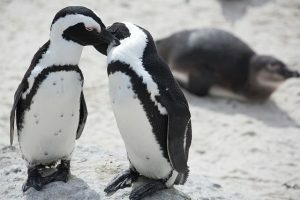 Or watch the penguins in their Polar Play Zone at the Shedd Aquarium. For a dessert break pick up cupcakes at Sprinkles Cupcakes at 50 E Walton St. west of the Magnificent Mile. Or stop in at the Magnolia Bakery at 108 N State St at Block 37.